The engagement ring is on your finger and the date’s been set. Now comes the decision of a lifetime—just where will you experience this grand, awe-inspiring, moment-to-remember, forever-cherished with the love-of-your-life event? We’re here to help. 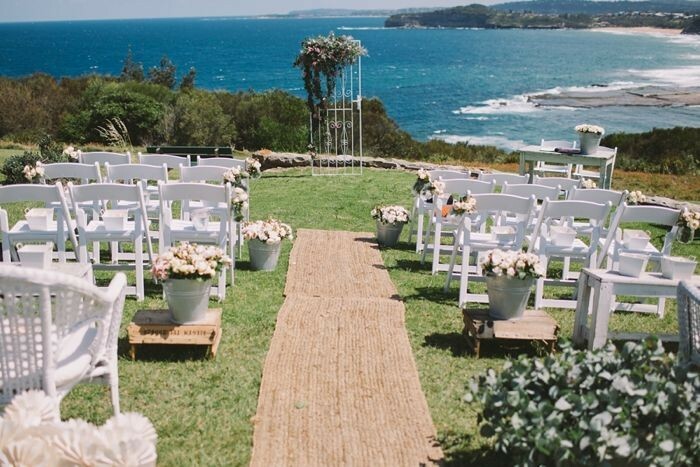 Sit back and relax while surfing through 9 Sydney wedding beach venues that will inspire you. On Sydney’s northern beaches in beautiful Whale Beach lies Moby Dicks. Recently renovated and refurbished, this locals favorite is set on a hill overlooking Whale Beach, creating a panoramic view—the perfect backdrop for your perfect day. Their inspired food and beverage packages make it easy to select and share fantastic modern Australian cuisine with friends and family. This is the venue for fantastic food, beautiful views, and an awesome Sydney wedding band providing the music and memories of a lifetime. Jonah’s offers a beautiful cliff top garden overlooking the stunning Whale Beach. This is your venue for outdoor never-ending views and indoor luxury. If you or your guests are considering spending the evening, Jonah’s accommodations include rooms with uninterrupted 180 degree ocean views, luxurious furnishings and Jacuzzis. You’ll enjoy exclusive use of the restaurant or terrace. This is where the ocean meets elegance. Picture a white timber arbor laced in ferns and flowers on the water’s edge and you’ve caught a glimpse of The Boathouse in Palm Beach. This venue offers a rustic, gorgeous setting on the Peninsula of Pittwater. The Boathouse on Shelly Beach is a recent addition to this well-known group of venues that offer eclectic and contemporary designs. If tropical, seaside gardens and a waterfall call to you, consider this your site. Located on the iconic west-facing beach in Manly, you’ll find your separate space accessible by a garden boardwalk and the seasonal food fresh and simple. This café is located on the Esplanade along Balmoral Beach in Mosman. If you’re thinking about a relaxed, rustic environment in a unique setting—this is your Boathouse. Open until 4pm. For those of you with an artistic flair, Coogee SLSC could be calling to you. This unique venue right on the water allows you to decorate and style the room as your heart desires. Have you pinned a wedding picture of a thousand twinkling lights to your wedding board? If you can dream it, you can create it. The room seats 100 – 110 people comfortably and offers stunning views over Coogee Beach in the Eastern Suburbs. Their BBQ style receptions are a favorite. Think relaxed, fun and fabulously you. Narrabeach Function Room offers floor-to-ceiling glass windows that overlook the lush lawns leading to the ocean. Here your dream day takes on its own distinct creation as you can choose your caterer, who has exclusive use of the commercial kitchen, decorator, florist and wedding singer or band. Another SLSC that offers a wedding venue designed by you. This elegant hotel and resort offers 10 venues located throughout Sydney and 40 in all. One of our favorites is Eventhouse Cronulla. This surfside venue offers both style and charm and is located on one of Sydney’s longest stretches of white sand beach. Their wedding packages include a dedicated wedding coordinator and an ocean-view room for the two of you. Relax and let their team do the work for you. Did your childhood dream-wedding include a grand ballroom and hundreds of elegantly dressed guests vying for your attention? This ultimate seaside getaway overlooks the Tasman Sea and can host up to 600 attendees. Their planning and catering team will ensure a flawless celebration and you and your honey will be enjoying an ocean-view room at the end of your enchanting day. Now that you have your perfect venue in mind, it’s time for the pièce de résistance: the music and your Sydney wedding band. This is the part of the venue that brings it all together, the music as your guests enter, the song for weddings you remember forever as you walk down the aisle, the first dance—“your song”—that will be replayed a million times. Your guests will remember dancing, at least most of them will, and the wedding singers that lifted their spirits and had the whole crowd doing the conga. Lily Road ensures a good time had by all—from gruff Uncle Tom to the friend you don’t remember inviting that seemed to show up anyway. We’ll work as a team, selecting the songs for the wedding that include a blend of music from the 60s to the present. Lily road consists of top vocalists and musicians that have shared the stage with top performers such as Maroon 5 and John Legend. Contact us for the best wedding entertainment in Sydney.